Mountain climbers from all over the world come to Talkeetna to challenge Mount McKinley. Most of them are flying to the Kahiltna Glacier Base Camp located at an elevation of 7200 ft. Be prepared to do this too ! 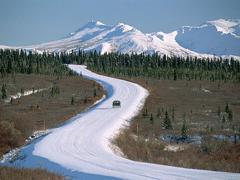 Extremely popular winter activities in Alaska are snowmobile tours around Petersville - just beneath the breathtaking Alaska Mountain Range with towering Mt. McKinley (20.320 ft), Mt.Foraker (17.400 ft) and Mt. Hunter (14.573 ft) in the background. The area accumulates about 6 ft of snow every year and provides more than 300 miles of partly groomed trails. 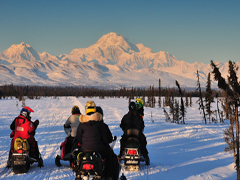 Another popular area is the incredible mountain scenery along Kesugi Ridge within Denali State Park. Morning Flightseeing Tour from Talkeetna to the Kahiltna Glacier Mountaineering Base Camp. (Optional Sightseeing/Activity Tour) Land on the glacier, stand beneath the towering mountains, enjoy magnificent views, realize their immense scale and get a sense of a destination that draws people from all over the world. The rest of the tour takes you within 6-miles of Mt.McKinley's north/south summit (20.320 ft). You will enter an ancient world of rugged high mountain peaks and glacier filled valleys. Take in the views of Ruth Glacier, the renowned Sheldon Amphitheater, Moose Tooth and the Great Gorge with a mile high granite walls - the worlds deepest and the intense blue melt water pools that dot the glaciers. 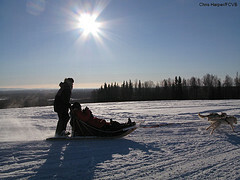 Return to Talkeetna and continue your journey back to Anchorage.